STAR WITNESS (AUS) (Chestnut 2007-Stud 2011). 4 wins-3 at 2-to 1200m, VRC Coolmore Stud S., Gr.1. Sire of 136 rnrs, 66 wnrs, inc. SW Global Glamour (ATC Flight S., Gr.1), Star Turn, Mella Maria, Pearl Star, The Barrister - High Volatility (H.K. ), Well Sprung, SP Kimberley Star, Magic Alibi, Serenade, Lineker, Stellar Collision, Typhoon Witness and of Arrestar, She's Our Star, Rare Occurrence, Firsthand, Sea Jade, Coerced Witness, Dixie Chick, etc. Starvasive (f. by Star Witness). Winner. See below. Anzali (Zabeel). 4 wins from 1600m to 2100m, CJC Speight's H., 3d CJC New Zealand Bloodstock Air Freight S., L, Warstep S., L, Dunedin Gold Cup Trial. DANASIA (Danehill). 4 wins. See above. SCRATCHY BOTTOM (Sebring). 3 wins from 1400m to 1900m, A$344,750, ATC Epona S., Gr.3, MRC Robert Hunter H., MVRC World Class Locally P., 2d South Australian Derby, Gr.1, 3d SAJC Schweppes Oaks, Gr.1, MVRC WH Stocks S., Gr.2, 4th ATC Chairman's H., Gr.2, Moonee Valley Fillies Classic, Gr.2, VRC Vanity S., Gr.3. Electric Fusion (Fastnet Rock). 5 wins from 1550m to 2000m, A$502,805, to 2015-16, VRC Zouki Western Health Cup, MRC Yarraman Village P., CFV Ambassadors H., MVRC World Class Locally P., Nelson Alexander Real Estate H., 2d BRC Queensland Derby, Gr.1, MRC Norman Robinson S., Gr.3, Abigkid.com P., Browns Sawdust & Shavings H., Anzac Commemoration H., Ladbrokes Challenge H., Argyle Maintenance H., MVRC City Jeep Patriot H., 3d SAJC Adelaide Guineas, L, VRC Byron Moore H., MRC Alannah Hill H.
CHEEKY CHOICE (Redoute's Choice). 4 wins-1 at 2-from 1300m to 1600m, A$625,425, AJC Flight S., Gr.1, STC Tea Rose S., Gr.2, AJC William H Ogilvie 2YO H., City Tatt's RC Napoleon Perdis H., 2d STC Queen of the Turf S., Gr.1, Canterbury S., Gr.2, AJC Australian Income Protection 2YO H., STC Escape to the Races 2YO H., Hyland Race Colours 2YO H., 3d MRC Thousand Guineas, Gr.1, 4th AJC Emancipation S., Gr.2. Producer. Prost (Show a Heart). 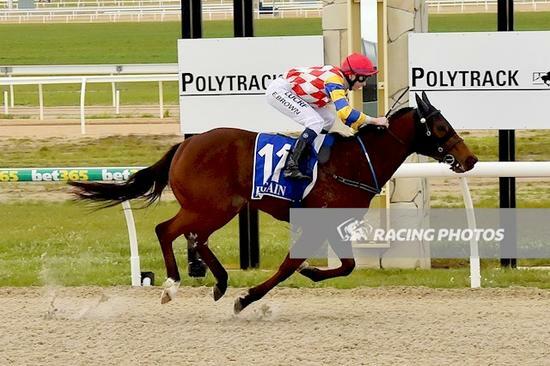 6 wins-1 at 2-to 1400m, A$276,875, BRC Coca-Cola Amatil H., Emporium Hotel H., Landfill Logistics H., Mother Energy H., 2d Clarence River JC Ramornie H., L, Kalgoorlie Boulder RC Hannan's H., L, BRC Iceworks H., Perfect Italiano H., Mother Energy H., 3d BRC Skyracing.tv H., Landfill Logistic H., Terrace Rugby H., Cyril Gilbert OAM H., STC Schweppervescence H., GCTC Smeg H., 4th Ipswich TC Eye Liner S., L.
JACKOFALL (Mastercraftsman). 3 wins-2 at 2-to 1200m, NZ$88,975, to 2015-16, Counties RC Murdoch Newell S., L, Manawatu RC 92.2 More FM H., 2d WRC Wellesley S., L, Hawkes Bay Dunstan Feeds Qualifer, WRC Crombie Lockwood Insurance H.
Race Record: 4 Starts 1-0-0 A$18,050.